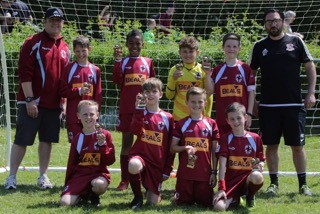 The Under 10s took part in the Bishops Waltham Dynamos tournament today, winning five out of seven group stage games, drawing two and not conceding a goal. In the semi-final they drew 0-0, but won the penalty shoot-out 3-2, and in the final sadly conceded a last minute goal to lose 1-0. The lads played brilliantly and were very unlucky not to win the tournament. This was the first tournament in which they have reached the finals so it was a massive performance from everyone. Well done!